in intersections across the city, which has no traffic lights. Visitors to the North Korean capital have a hard time forgetting the young women who stand at major intersections in uniforms and direct the few cars on the road with gestures that seem inspired by military drill sergeants and professional boxers. Pyongyang does not have traffic lights. One of the few state secrets that residents of the North Korean capital will share with foreign visitors is that these women are often selected for their looks. 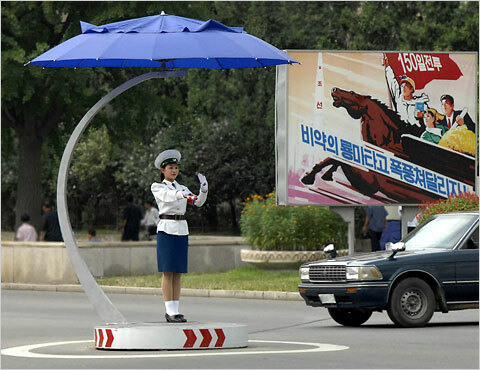 I assume that if North Korea ever gets the 2.5 cars per household as in the U.S. these traffic beauties will need to start wearing breathing apparatuses and be surrounded by cement blocks, to protect them from high speed police chases and 16 yo texters. 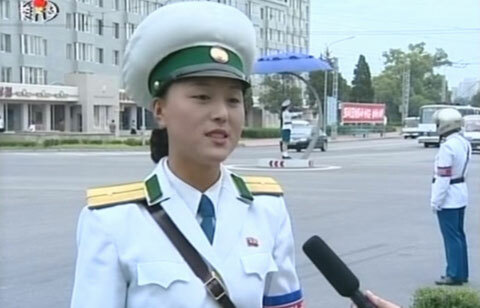 i see a traffic girls of pyongyang calendar……. I like the girls under the umbrellas. As well, they provide jobs for women in a country that could probably use a few more jobs. North Korea does have traffic lights, they just prefer to use the girls since they feel drivers will pay more attention. Since the traffic is light, it works fine. But they 100% definitely do have traffic lights, I verified this in Pyongyang about 2 months ago. Me thinks the “Great Leader” and KCNA missed a golden opportunity. A better brainwash release would have been one that suggested Kim Jong-il manipulates the weather on a daily basis to ensure strategic cloud cover for each and every traffic gal. And throws in a rainbow here and there for the most efficient traffic guiders. It’s interesting that many people assume that if there are no traffic lights, it must be because DPRK cannot “afford” them. This cultural-centric worldview assumes that our way of doing things is the only proper way, and that all of humanity would automatically do things like we do absent some intervening force. This is Hilarious im not sure why others haven't commented yet. a pun off of the weather girls song its Raining men. "its Raining Pt Gilrs Hallelujah"
If you read the youtube comments on that video, it's amazing that some people actually think it's real.